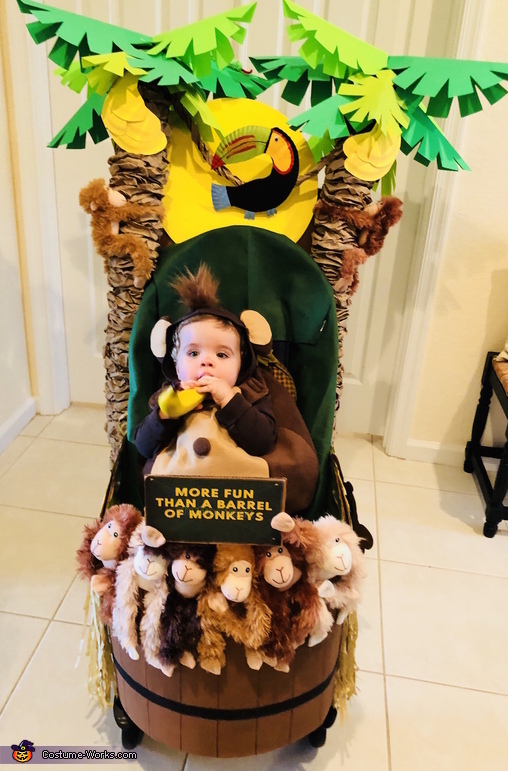 This homemade costume for babies entered our 2018 Halloween Costume Contest, and won 3rd place in the Cutest Baby Costume nomination! This is Kevin our 1 year old. It was easy deciding what to make him since we call him "Our Chunky Monkey". I wanted to also use his coach in the costume idea because he is not walking yet. I came up with a theme which is "More Fun Than a Barrel of Monkeys". A pattern was used to make his costume. The coach was constructed off two pool noodles which were covered with brown paper and pasteboard cut into leaves for the top of the banana trees. The bananas were made from paper plates and painted yellow as well as the two tucans which I cut out from a paper plate then painted.